Conference expansion: should The Citadel join the Big 10? With all this expansion talk, there is a chance the Big 10 (motto: “Just ignore the ’10’ thing”) might wind up with an odd number of teams. Of course, it has an odd number of teams right now. However, I’m thinking that when all the dust settles from this latest realignment, Jim Delany and company are going to want to be at 12 or 14 or 16 teams, if only to end speculation the league might expand again (and thus prevent all those late-night telephone calls from the folks at Iowa State begging for admission). If the Big 10 needs an extra team, The Citadel would be an obvious candidate and would presumably get an invitation. The question is, should the military college accept the Big 10’s offer and leave the Southern Conference? What are the positives and negatives of making the move? The Citadel would be a favorite to win the league in baseball every season. Also, we could probably demand that all of our conference games would be played at Riley Park. Fun spring trip for the guys from Minnesota and Wisconsin, and an easy three-game sweep for us. –All home games in football and basketball would be on TV, along with a lot of televised games for the other sports. Also, the Big 10 Network has a slightly larger distribution nationally than the SoCon TV package. It’s important for The Citadel to increase its TV presence, as I have written many times before. I have previously advocated playing Big 10 teams in non-conference action so as to get on TV. Now, the opportunity could be there to play Big 10 teams as league games. –By 2012 or 2013 or whenever we joined the league, there is a chance Indiana still wouldn’t have its act together on the hardwood and we could snag a road victory at Assembly Hall, which would be neat. Plus, you know Nebraska won’t be any good at hoops, and Northwestern would be a promising opportunity for a road W. So we could be competitive almost immediately. –A new recruiting territory would open up, and with the advantage of offering recruits the best weather in the conference (unless Texas joins the league, and even then it’s a push). The Citadel has already had some good luck recently with players from Big 10 country (Ohio is the home state for basketball’s Austin Dahn and baseball’s Justin Mackert). If Texas winds up in the conference along with the Bulldogs, that opens up the Lone Star state even more to The Citadel’s predatory hoops recruiters (see: Cameron Wells, Zach Urbanus, Mike Groselle). With that type of opening, regular trips to the Final Four would be inevitable. –The extra money from being a Big 10 member could go toward expanding Johnson Hagood Stadium. The Big 10 could also flex its collective muscle and break the NCAA’s silly postseason ban in the Palmetto State. That, combined with the newly expanded JHS, would result in a new bowl game for Charleston, so the community would also benefit. –Well, the road trips would feature a lot of snow and ice (excepting UT-Austin, which would probably be worth a mandatory travel game for the corps of cadets). There is only so much places like East Lansing and Iowa City have to offer (not to mention Lincoln). That’s why you can expect a lot of the league meetings to get moved to Charleston. Also, look for a lot of the Big 10 coaches to acquire beachfront property in the Low Country, a la Roy Williams, Ralph Friedgen, Les Robinson, etc. It’s just a natural thing for them to do. –The Citadel probably would not be able to play schools like Chowan or Webber International in football. Wait, that’s a positive! –Women’s sports: The Citadel has a limited number of women’s teams, and the ones we have would probably struggle in the Big 10. We don’t have a women’s lacrosse program, though, which may be just as well. –The other schools in the Big 10 would be much larger than The Citadel, which could lead to their fans trying to take over our home parks/arenas. If we made sure the corps of cadets was fully armed before games, however, I think we would maintain our home field advantage. –There is a possibility that a spot in the ACC or SEC could open up. If that happens, it’s important for The Citadel to explore all its options. All in all, I’m undecided about a potential berth in the newly constructed Big 10. One thing I can say for sure, though, is that The Citadel will be okay wherever it lands. Can Rutgers or Kansas say the same? The “positives” you listed are for Citadel, not the Big 10. 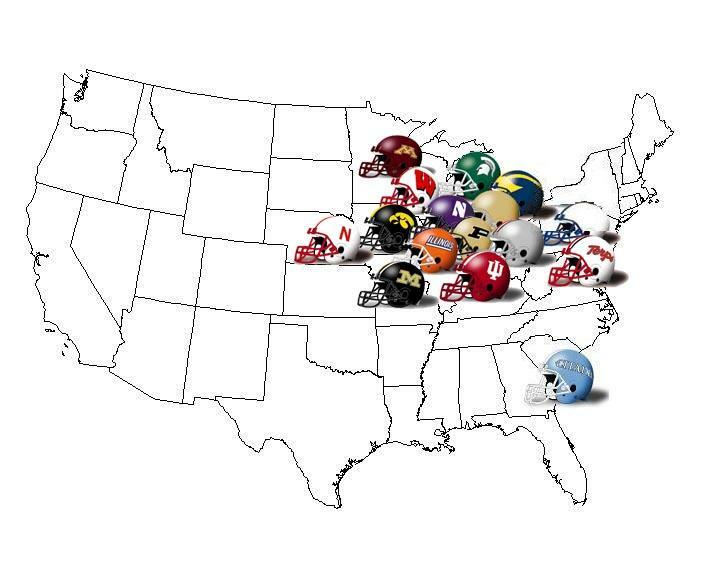 Football is driving conference expansion and if the Big 10 went insane and were to invite a SoCon team, it would be App. State, not the Bulldogs. Also, there is the little item of any SoCon team moving from from the FCS to the FBS. You bash UNCG, but to be honest, the only thing Citadel offers is Charleston. With that logic, the Big 10 should invite Charleston Southern. Stop this nonsense and write about something worthwhile.